The Moonbow 50K is a 3x looped trail race that begins at the Visitors Center in Cumberland Falls State Park. The people of this area were hearty folk and this course will show you how they got that way. With roughly 95% of the course off-road (including a segment of the Sheltowee Trace Trail - Kentucky's long-trail), runners will traverse miles of rugged, winding, and at times grueling single-track trail. Natural landmarks you'll encounter include stunning rock houses and overhangs, creek crossings and magnificent waterfalls. 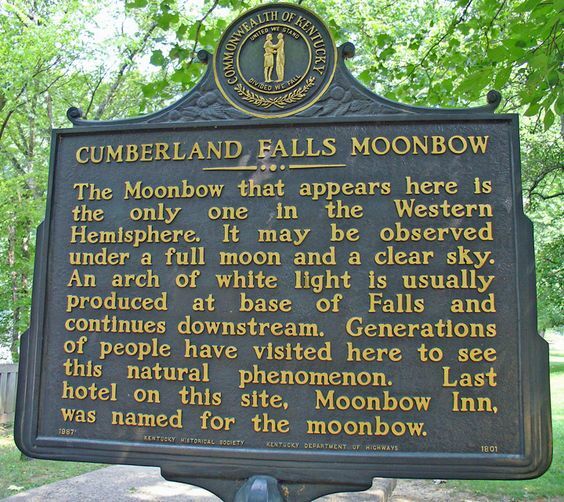 Most striking is the iconic finish just a short walk from the 68-foot high, 125-foot wide Cumberland Falls - home of the moonbow -- often referred to as 'The Niagara of the South'. Natural beauty doesn't come to you - you go to it. Come on out, retrace the steps of the hearty folk that once called this place home and redefine what you call flat terrain. *Moonbow 50K is a very technical and challenging course and is highly recommended to have some experience before entering. There is a 11 hour cutoff time for the Moonbow 50K (All 50K participants must finish first full loop by 1:00pm to start second loop. All 50K participants must finish second full loop by 5:00pm to start third loop). The Moonbow 30K is a 2x looped trail race that begins at the Moonbow trail head near the Visitors Center in Cumberland Falls State Park. The people of this area were hearty folk and this course will show you how they got that way. With roughly 95% of the course off-road (including a segment of the Sheltowee Trace Trail - Kentucky's long-trail), runners will traverse miles of rugged, winding, and at times grueling single-track trail. *Moonbow 30K is a very technical and challenging course and is highly recommended to have some experience before entering. There is a 7 hour cutoff time for the Moonbow 30K (All 30K runners must finish first full loop by 1pm to start second loop). 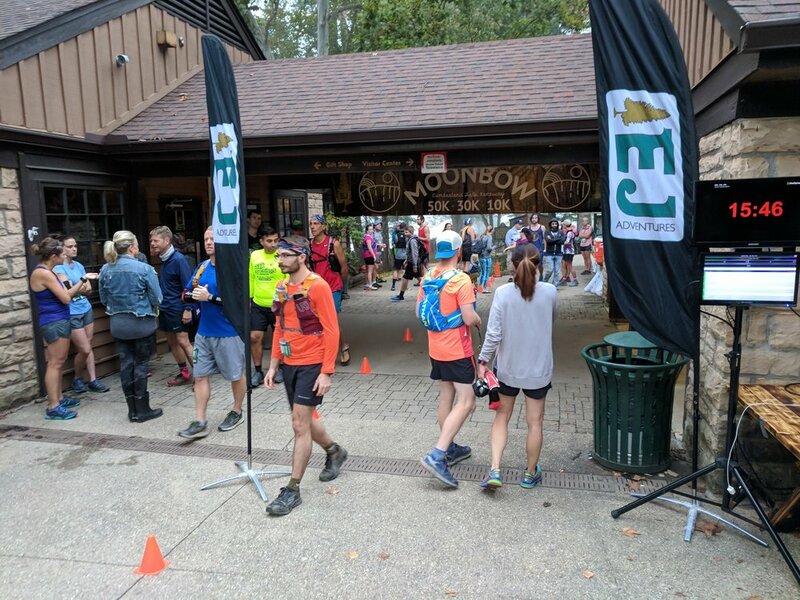 The Moonbow 10K is a looped trail race that begins at the Moonbow trail head near the Visitors Center in Cumberland Falls State Park. The people of this area were hearty folk and this course will show you how they got that way. With roughly 95% of the course off-road (including a segment of the Sheltowee Trace Trail - Kentucky's long-trail), runners will traverse miles of rugged, winding, and at times grueling single-track trail. *Moonbow 10K is a very technical and challenging course and is highly recommended to have some experience before entering. 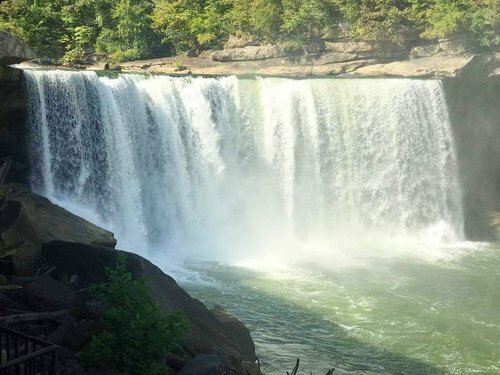 5:00pm - 8:30pm | 50K, 30K, and 10K Runner packet pick-up @ Cumberland Falls Visitors Center. 8:30pm - 9:00pm | Optional pre-race runners meeting @ Cumberland Falls Visitors Center. 5:30 am – 7:00 am | 50k/30k/10k Last Chance Runner Packet Pick up and Mandatory check in @ Cumberland Falls Visitors Center. EJ Adventures will do it's best to follow the leave no trace philosophy and hopes you will agree to do your best to keep our Kentucky lands the same way before we started. This is a certified USATF event and all participants MUST sign a USATF waiver before event. Runners will need to check in and out of each aid station. This is for the safety of our runners and we don’t want to have to send an EMT team out to look for you just because you didn’t check in. If you want to drop out of the race at any time, you must inform the nearest aid station. This is a cup-free event. All participants MUST have a 12 ounce bottle or camel back to start race. Leave no trace. Removing wildflowers or anything from the land will result in disqualification from all future events. Due to Forest Service regulations, no pacers. No headphones on course. This is for your and other participants safety. Moonbow Ultra entrants may switch to another distance up until September 1st 2019, if the distance they are switching to has not reached full capacity. This is all done through ultrasignup.com. If an entrant would like to move down a distance, they can, but will not receive a refund. If an entrant would like to upgrade, their original order is removed and they will be given credit to re-register for another distance, at the price of their original distance. Moonbow Ultra entrants may transfer their registration to another participant if they cannot make the event up until September 1st 2019. This can be done through ultrasignup.com. The transferor will see a “Transfer Registration” button on their order edit screen. The order edit screen can be accessed via the Edit link on their receipt or in their registration history. The original order is “removed” and a 100% credit is added to the system for the exact event under the transferee’s name and email. The transferee is also sent an invitation that will let them bypass a closed or filled event. Proceeds from race go towards Kentucky State Parks and trail maintenance for public use. In the event Moonbow Ultra has to be cancelled due to extreme weather, fire, flood, or some other unforeseeable event, we cannot offer refunds, though we will make a conscious effort to issue credits based on race funds not used. *Can't participate this year but want still want to be a part of an incredible weekend?! We are in need of volunteers to make this event run smoothly and will guarantee you are rewarded in return for dedicating your time to a good cause!